I just got back from a week's vacation so this will be pretty short as the email box is quite full as so is the calendar. But it is worth it. Consider the alternative, which is what I tried this past summer - taking Friday afternoons off. What a failure. While it did avoid the overstuffed email box and calendar, what it really did was shorten the workweek, but not anyone's expectations of what I would/could/should accomplish. So no more of that approach. This week was different. Everyone knew I was gone so no one expected me to do anything (except for the calls when there were some critical issues that really needed my input). Today will be hectic, but a week of peace and quiet was worth it. 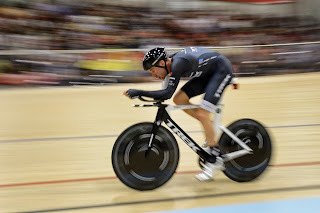 I even got to see Jens Voigt break the hour record online without feeling guilty about it. The hour record is arguably cycling's most difficult accomplishment and also it's simplest. You ride and see how far you can go in an hour. Whether or not you break it, it breaks you. It takes months of specialized preparation and then some. The effort is as much psychological as physiological, and there are months of recovery afterward just so you can look at your bike again and not want to destroy it with a 10-pound sledge. Hence, it is usually the capstone effort of a career and Jens is just such an example. He has now retired from professional bicycle racing. September 22, 2010 - Watch out all you Grandparents!